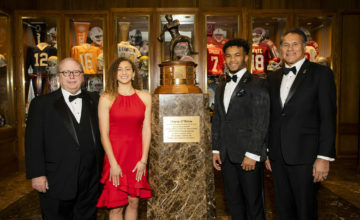 FORT WORTH, Texas (Nov. 19, 2018) – Washington State senior Gardner Minshew II, Oklahoma junior Kyler Murray and Alabama sophomore Tua Tagovailoa have been selected as the three finalists for the 2018 Davey O’Brien National Quarterback Award, the Davey O’Brien Foundation has announced. After totaling the ballots from the Davey O’Brien National Selection Committee as well as fan votes recorded over the past two weeks at VoteOBrien.org, the 16 semifinalists were narrowed down to the trio of signal callers. They will be featured on ESPNU’s The Home Depot College Football Awards Nomination Special Tuesday at 2:30 p.m. (ET)/1:30 p.m. (CT). All three are first-time finalists for the award. Alabama and Washington State have never had a Davey O’Brien National Quarterback winner, while Oklahoma has had three previous players win the Davey O’Brien Award a total of four times–Jason White (2003, 2004), Sam Bradford (2008) and Baker Mayfield (2017). Minshew II, the second Davey O’Brien Award finalist in school history, has thrown for an NCAA-best 4,325 yards while completing 70.4 percent of his pass attempts (407-for-578). He has tossed 36 touchdowns against seven interceptions, and has added three rushing scores. In addition to leading the nation in passing yards, the senior transfer also ranks first in total offense per game (401.5), completions per game (37.0) and touchdown passes (T1st, 36). He also ranks among the top 5 in the NCAA in points responsible for (4th, 234) and completion percentage (5th, .704). Against Arizona on Saturday, Minshew II was 43 of 55 for 473 yards and a school-record and 2018 NCAA-best seven touchdown passes. He has topped the 300-yard passing mark in all 12 games and has eclipsed the 400-yard plateau six times. The native of Brandon, Miss., has vaulted Washington State to a school-record-tying 10 wins (10-1) and a current ranking of seventh in both the Associated Press and Coaches Polls. Minshew II joins Ryan Leaf (1997) as Cougar finalists for the award. Murray, who gives Oklahoma a Davey O’Brien finalist for the fourth straight season, has amassed more than 4,000 total yards of offense (3,310 passing and 739 rushing). The junior has completed 196 of 279 passes with 34 touchdowns, and has also scored 10 rushing touchdowns while averaging 7.1 yards per carry. Nationally, Murray ranks second in points responsible for (264), passing efficiency (205.8), total quarterback rating (95.5) and passing yards per attempt (11.9). He also is among the NCAA top 10 in total offense per game (3rd, 368.1), touchdown passes (4th, 34), completion percentage (6th, .703) and passing yards (8th, 3,310). The product of Allen, Texas, has accounted for at least four touchdowns on eight occasions, highlighted by a game against Baylor when he totaled 477 total yards and seven scores. He was named the Davey O’Brien Quarterback of the Week on Sept. 13. Oklahoma sports a 10-1 record and a No. 6 ranking in the Associated Press and Coaches Polls. Murray joins Mayfield (2015, 2016, 2017), Bradford (2008), White (2003, 2004) and Josh Heupel (2000) as the Sooners’ finalists all time. Tagovailoa, the second Alabama finalist in more than two decades, has completed 164 of 237 passes for 2,865 yards and 31 touchdowns against just two interceptions this year. He also has added 185 yards and four scores on the ground, while guiding Alabama to an average victory margin of 35.6 points per game. The sophomore leads the country in three categories–passing efficiency (212.5), total quarterback rating (95.7) and passing yards per attempt (12.1). In addition, he is among the NCAA leaders in touchdown passes (7th, 31), completion percentage (8th, .692), points responsible for (8th, 210) and passing yards (16th, 2,865). Tagovailoa owns four 300-yard passing games and has totaled three or more touchdowns eight times. Against Texas A&M, he was 22-for-30 passing for 387 yards and four scores, and also added a touchdown on the ground. The native of Ewa Beach, Hawaii, has helped steer Alabama to an 11-0 record and the top spot in both the Associated Press and Coaches Polls. Previous Crimson Tide finalists were A.J. McCarron (2013), Jay Barker (1994), Mike Shula (1986) and Walter Lewis (1983). Minshew II, Murray and Tagovailoa were selected among the list of semifinalist contenders that also included: Ian Book (Notre Dame), Mason Fine (North Texas), Ryan Finley (NC State), Jake Fromm (Georgia), Will Grier (West Virginia), Dwayne Haskins (Ohio State), Justin Herbert (Oregon), D’Eriq King (Houston), Trevor Lawrence (Clemson), Jordan Love (Utah State), Marcus McMaryion (Fresno State), McKenzie Milton (UCF) and Shea Patterson (Michigan). 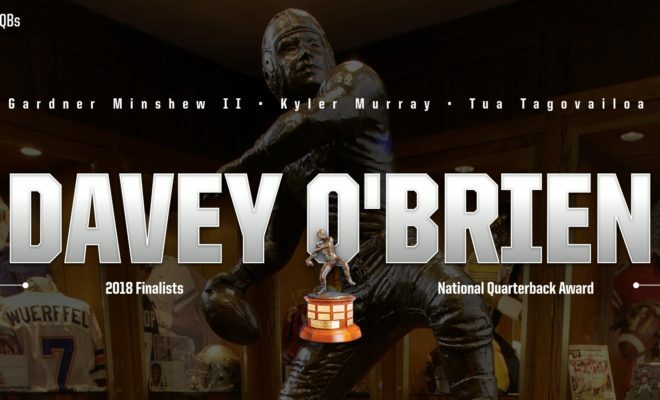 The Davey O’Brien National Quarterback Award is presented annually to the best college quarterback, and is the nation’s oldest and most prestigious national quarterback award. The Davey O’Brien Fan Vote counts as five percent during each round of the voting process, and is combined with the results from the foundation’s national selection committee, which is comprised of journalists, broadcasters, commentators and former winners. After clearing the first round totals, the fan vote at VoteOBrien.org will reopen today (Nov. 19) and remain open until 5 p.m. (CT) on Sunday, Dec. 2, for the final round of balloting. Fans are invited to cast their vote for the nation’s best college quarterback as often as once daily per email address. The 2018 Davey O’Brien winner will be announced live on The Home Depot College Football Awards Thursday, Dec. 6. All three finalists will attend the festivities that day in Atlanta, Ga. 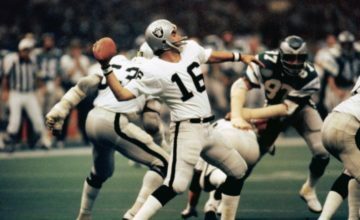 Previous winners include: Jim McMahon (BYU, 1981), Todd Blackledge (Penn State, 1982), Steve Young (BYU, 1983), Doug Flutie (Boston College, 1984), Chuck Long (Iowa, 1985), Vinny Testaverde (Miami, 1986), Don McPherson (Syracuse, 1987), Troy Aikman (UCLA, 1988), Andre Ware (Houston, 1989), Ty Detmer (BYU, 1990-91), Gino Torretta (Miami, 1992), Charlie Ward (Florida State, 1993), Kerry Collins (Penn State, 1994), Danny Wuerffel (Florida, 1995-96), Peyton Manning (Tennessee, 1997), Michael Bishop (Kansas State, 1998), Joe Hamilton (Georgia Tech, 1999), Chris Weinke (Florida State, 2000), Eric Crouch (Nebraska, 2001), Brad Banks (Iowa, 2002), Jason White (Oklahoma, 2003-04), Vince Young (Texas, 2005), Troy Smith (Ohio State, 2006), Tim Tebow (Florida, 2007), Sam Bradford (Oklahoma, 2008), Colt McCoy (Texas, 2009), Cam Newton (Auburn, 2010), Robert Griffin III (Baylor, 2011), Johnny Manziel (Texas A&M, 2012), Jameis Winston (Florida State, 2013), Marcus Mariota (Oregon, 2014), Deshaun Watson (Clemson, 2015-16) and Baker Mayfield (Oklahoma, 2017). 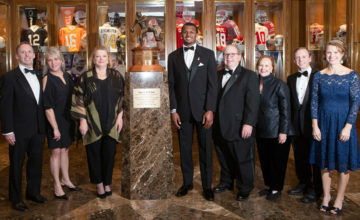 The 42nd Annual Davey O’Brien Awards Dinner will be held Monday, Feb. 18, 2019, at The Fort Worth Club in Fort Worth, Texas. Gardner Minshew II, Washington State, Sr., 6-2, 220, Brandon, Miss.